Believe or not, it wouldn’t be wrong to say that the WhatsApp resides in almost each and every Smart Phone on this planet. To estimate WhatsApp popularity, just GIFT anybody a brand new Smart Phone and examine which first application the person is trying to install into the gifted Smart Phone. When the service is used by this much of the people, there are the occasions when some people don’t want to connect with some specific people. To get rid of this, they simply block them in their WhatsApp messaging app. Once blocked, the blocked person will never be able to connect with the person who has blocked him. The reasons people block other people could be countless, below are some main reasons out of them. Later, we will expose the only options you are with, to Check If Somebody has Blocked You on WhatsApp. Reasons Why People block other people on WhatsApp. If they don’t want anybody to be a part of their lives. If anybody is disturbing or irritating you by sending or making irrelevant messages or calls. Although this maybe a temporary block. If anybody is stalking you by sending or making inappropriate, unacceptable messages or calls. This will be a permanent block. If you are angry with somebody and wants some time to heal your mind, blocking the person is surely the best solution for the sake of your relationship with that person. If anybody don’t want to share their personal information like status, specific profile picture or last seen time to any person. This will always be a temporary block, although there are other easy steps in WhatsApp account privacy section to avoid this blocking act. Last but not the least, people block other people in some professional conditions too, when your company policy doesn’t permits anybody to be connected with any of the rivals or competitors. Now the main question to investigate, how do the blocked person know that somebody has blocked him due to any of the activity ?. Actually there is no way to get 100% sure if you have been blocked by somebody. WhatsApp system had made this act deliberately uncertain in the process of protecting privacy of the users when they block somebody. 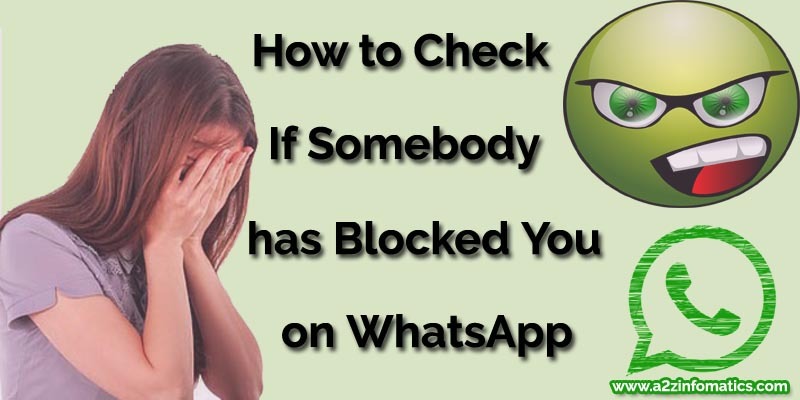 Although there are some strong indications which can help you to get 99.99% sure that somebody has blocked you on WhatsApp. Prior to moving forward to the complete detailed indication which can help you to confirm if you have been blocked on the WhatsApp, you need to know / understand the WhatsApp check mark / tick mark indications against the sent message. 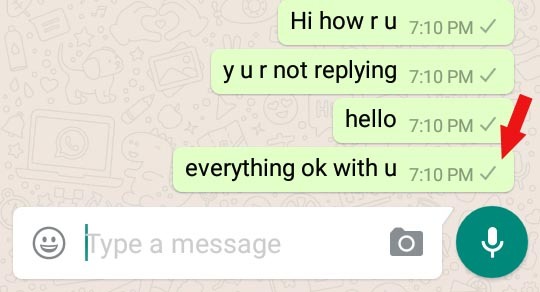 How to know who blocked you on WhatsApp ? Understanding WhatsApp check mark (tick mark) and clock icon indications against the sent message in WhatsApp. 1)- The “Clock Icon” on the sent message bubble: This indicates that the message is still in the device, haven’t departed to any where. This generally happens, if the user is not connected to the internet OR the user is on any slow network connection. You can anytime stop the message delivery to the recipient, if the clock icon is showing in the sent message bubble, by simply deleting the message from your device. 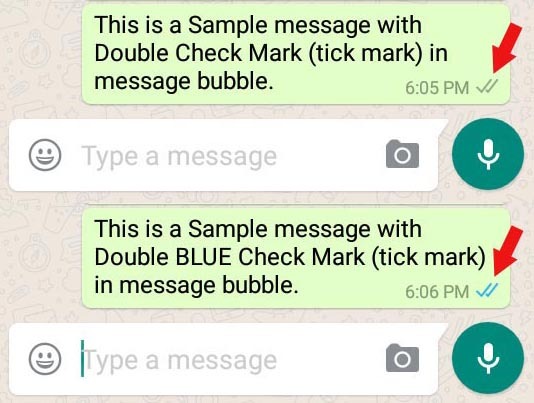 2)- Single check mark (tick mark) on the sent message bubble: This indicates that the message has departed from your device and is arrived at the WhatsApp server. The single check mark (tick mark) will be grey in color, you can’t stop the message delivery to the recipient once there is single tick mark against the message. 3)- Double check marks (tick marks) on the sent message: This indicates that the message has been successfully delivered to the recipient device. Once the recipient has checked / seen this message, these double tick marks will get converted into Blue in color. You will see Blue double check marks (tick marks) instead of the Grey double check marks (tick marks) once the message has been seen by the recipient. We hope, You are now fully aware of this check mark (tick mark) system in the WhatsApp, let we move forward to the much awaited section about the indications to know if somebody has blocked you on WhatsApp. Believe us, the tick mark explanations will help you a lot to understand the below actual indications to guess if you have been blocked on WhatsApp. Steps about Checking If Somebody has Blocked You on WhatsApp. 1)- Open WhatsApp in your device and get into the contacts section. In Android the contacts section will be at upper-right of the screen, in iOS there is contacts icon at the bottom-center of the screen. 2)- Scroll till you find the suspected user, who you guess has blocked you. 3)- Check suspected user’s status message & profile picture. If you are unable to see the status message as well as the profile picture, there are strong indications that you have been blocked by the user. Although, the user may have opted out to show this information to everybody or the contacts under the WhatsApp account privacy section. 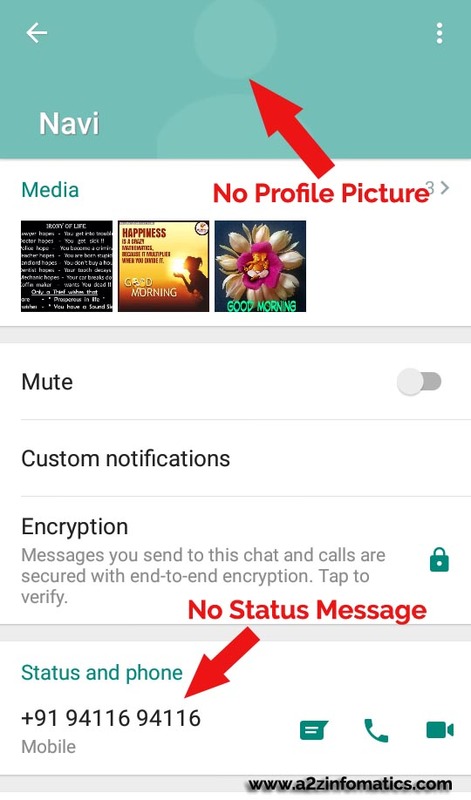 In case you have associated any picture in the phone’s contact book, you may see the same picture as a profile picture for the suspected user. 4)- Check suspected user’s “last seen” Time-Stamp. If you are unable to see the “last seen” Time-Stamp of the suspected user, there are strong indications that you have been blocked by the user. Again, the user may have opted out to show the “Last seen” Time-Stamp information to everybody or the contacts under the WhatsApp account privacy section. Do check your’s “last seen” Time-Stamp settings under the account privacy section, If you have opted out to show to other, you won’t be able to see other’s “last seen” Time-Stamp information. 5)- Send message to the suspected user. After sending the message, just examine the sent message bubble. If you see single check mark (tick mark) against the sent message for a long period of time, Sorry Dear 🙁 You have been blocked on WhatsApp. If you are able to see the double check mark (tick mark) against the sent message, don’t waste any more of your’s precious time here … You are safe. Yups, we confirm you are not blocked. 6)- Go to the suspected user’s profile section by tapping user’s name at top of the chat windows. Examine the profile for 2-3 days. If it remains the same all the time, there are strong indication that you have been blocked by the user. 7)- Ignore the calling option to check if you have been blocked on WhatsApp, the ring will go as normal in both the situations. Great privacy implemented by the WhatsApp 🙂 Good Job, we appreciate this 🙂 . 8)- The last but not the least, you can ask the suspected person directly, if option available to you. By this you will get aware of the reason for which the person has taken this rude step, if somebody has blocked you on WhatsApp. In addition there are chances that you can sort out the misunderstandings if there are any. Today, we had discuss each and every aspect about investigating if we have been blocked or not by anybody. Make this a note, you always have to rely on these indicating signals to find if you have been blocked because WhatsApp will never reveal this information openly due to the sake of privacy of the WhatsApp users. We hope, you are able to sort many of your doubts by going through this piece of information. Suggestions are always invited under the comments section below, do share any left strong signal to check if somebody has blocked you on WhatsApp. That’s all for now, we will be shortly back with some more helpful stuff. Till then … Tata … bye bye … Keep visiting this blog. Subscribe to get the latest updates direct into your mailbox.